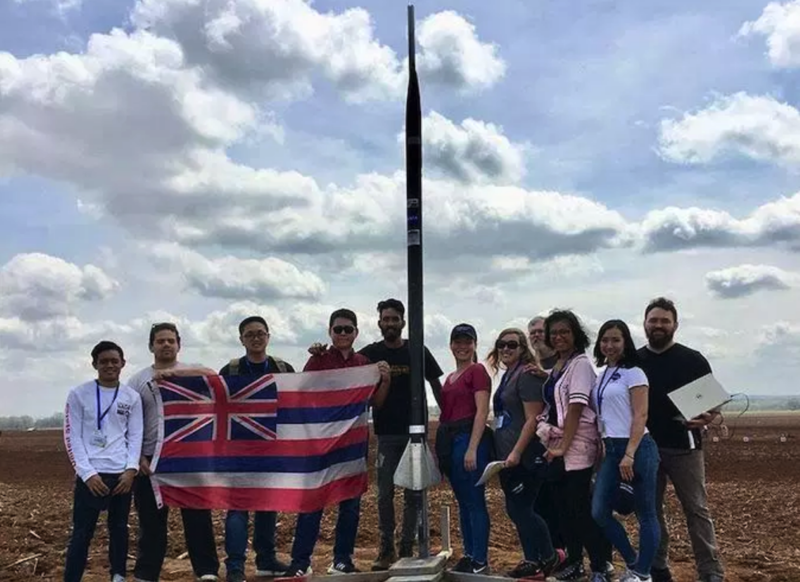 On April 6, the Hawaii team successfully launched its 10-foot-tall rocket “Fissure 8,” named after the prominent volcanic vent in the 2018 Kīlauea eruption on Hawaiʻi Island. The competition included 45 teams from 20 different states. Project Imua Mission six team consisted of 10 students from from Honolulu, Kapiʻolani and Windward Community Colleges and UH Mānoa. Project Imua is a joint faculty-student enterprise of four University of Hawai‘i Community College campuses. Their primary mission is to develop small payloads for space flight while providing undergraduates with project-based learning opportunities in STEM fields. Hawaiʻi Space Grant Consortium awarded Project Imua a grant of $65,931, which covered materials, student stipends and travel expenses. Before the launch, students were challenged to predict how high their rocket would go or “call their shot.” The students on The Project Imua project six team predicted the rocket would travel 4,700 feet into the air, but the rocket actually traveled 4,338 feet high. By the end, even with the rocket not getting as high as originally predicted, the students were glad to see that their hard work had payed off.